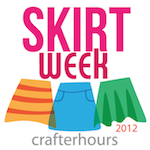 I'm so pleased that Susan and Adrianna at Crafterhours invited us to participate in their annual Skirt Week series this year. From the many times I was teased as a girl for preferring long prairie skirts over jeans, til today when moms at my daughters' schools frequently ask me why I'm "so dressed up," I just love skirts. It's been really fun this week to have an excuse to think about them so much! Susan asked me to share some of my favorite Spoonflower fabric designs that work well for skirts and I certainly have my own opinions and preferences. But since the Spoonflower office is jam-packed with sewing enthusiasts, it seemed a shame not to ask them, too, and they didn't disappoint. Offering their favorite design picks are Holly, our operations manager, Melodie and Allie, both printer operators, and Caroline, our graphic designer. We were all in pretty close agreement about our favorite types of fabric for skirts–more about that later–but we all chose very different designs. 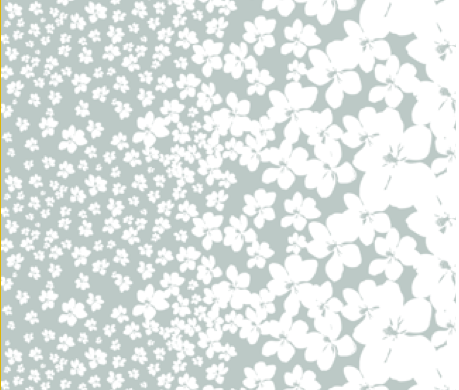 Some of their favorites were designs that even I hadn't run across before on Spoonflower, and I hope you enjoy them, too. Let's get started with some pretty designs! 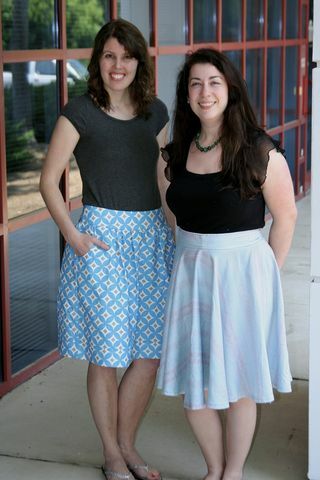 Holly standing at left is modeling a pretty summery skirt made up in linen/cotton canvas printed with Spoonflower designer Holli Zollinger's design, "Diamond Circles." (That's the aqua colorway shown on Holly's skirt above.) 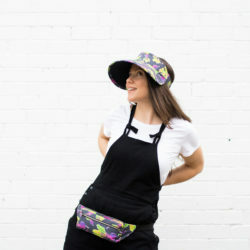 Holli uses a lot of geometric shapes and stylized motifs in her designs and she's a Spoonflower staff–and Spoonflower customer!–favorite designer. Chevrons, large-scale plus signs, and highly stylized natural motifs like flowers and raindrops are all featured in Holli Zollinger's designs and make up into really striking, sophisticated skirts. Pictured next to Holly on the right, Melodie is wearing a skirt made from organic cotton sateen printed with a design by KristopherK called "French Stripe." 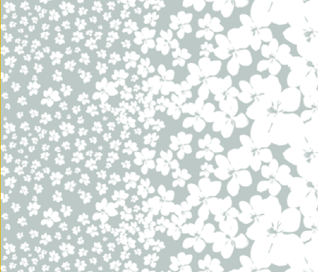 KristopherK is another popular designer on Spoonflower with a more subdued and romantic design style. Personally, I love KristopherK's lovely "Magnolia Little Gem" series which features white flowers falling across the width of their solid-colored backgrounds. 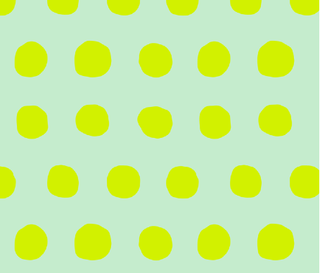 The "Arctic" colorway in this series is shown above. You could cut simple A-line skirt panels on the crosswise grain of any of these fabrics and end up with an incredible skirt! 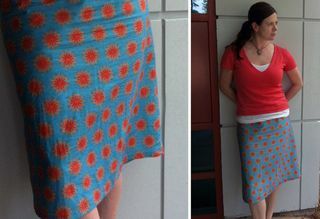 Caroline, shown here standing outside the Spoonflower office front door, is wearing an A-line skirt she made from organic cotton sateen printed up with her own design, "Red Eyed Susan." 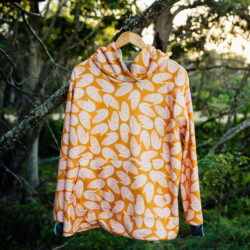 Caroline actually has quite a few designs she's worked up in her Spoonflower shop, and has been giving her new sewing machine a workout using lots of prints of her self-designed, yoga-inspired favorites. 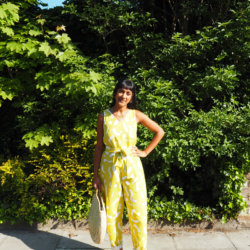 When it comes to the types of prints she tends to like, she says, "The bolder, the better!" Her skirt pick from the Spoonflower marketplace is a kawaii style print by Zesti. 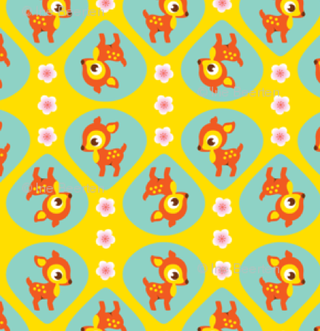 Tiny deer printed onto an electric yellow skirt, anyone? 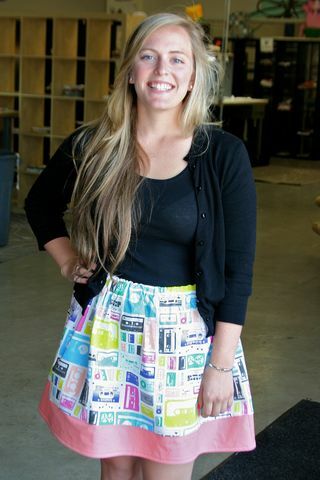 Allie is shown here wearing a cute skirt she made out of Pennycandy's "Mix Tapes" design printed onto organic cotton sateen. Amy Peppler Adams is the Seattle based designer behind the Pennycandy front, and her style is circus- and retro-culture inspired with bold type fonts, jukebox song labels and 1960's coffee cups rendered in primary colors. These are bold choices for clothing items, but I think summer is a great time for playing around with novelty prints for clothing. 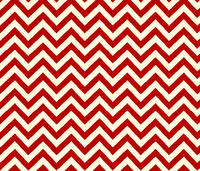 Novelty prints are also known as "conversational prints" in the fabric world. Don't you imagine conversations about your colorful skirts at the farmer's market, neighborhood cook-outs, and ice cream shops? Allie says her next project will likely be a skirt made up in one of Domesticate's "Jumbo Dots" prints. That's the mint/neon colorway shown here. The dots are a hefty 2-inches in diameter! Next up is me wearing a wrap skirt made from organic cotton sateen (care to guess one of the Spoonflower staff's favorite fabric types for skirts?) printed with Thebline's "ABP Chandelier" design. I love its simple blue on white palette, but now feel like a complete dork for being the fourth person in this post to be wearing a black shirt with their Spoonflower skirts. That was definitely NOT planned! My next skirt will be made up in another Thebline design called "ABP par avion" which looks just like the pattern trimming air mail envelopes, don't you think? 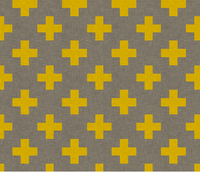 I've got two yards of this design printed on organic cotton sateen sitting on my dining room table right now, suggesting that it will figure prominently in my upcoming long weekend. But sturdiness isn't all that's needed in a skirt. I find that quilting-weight cotton tends to produce a stiffer skirt that doesn't drape as well as other fabric types. It stands out from the body a bit rather than hanging in nice folds or swirling about my legs. Most of us skirt sewers at Spoonflower tend to use our organic cotton sateen or linen/cotton canvas for skirt projects instead. The organic cotton sateen drapes just beautifully, has a lovely, subtle sheen, and measures a nice, wide 56-inches across. The linen/cotton canvas is also a nice choice for more structured types of skirts; it holds pleats and crisp edges beautifully and is a generous 54-inches wide. If you really want a flowy, feminine look, cotton/silk, cotton voile (with a lining), or silk crepe de chine are luxurious choices. Just tell your kiddos there is to be no nose-wiping, please. 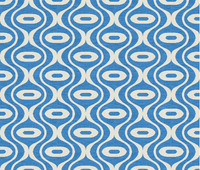 I hope you all enjoy the Spoonflower staff picks for skirts. 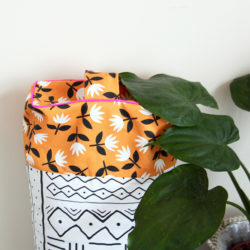 Now on to some pretty weekend skirt-sewing projects!